Generally, if the marijuana was for personal use, the law will not treat you as severely as if the marijuana was being sold. If you are caught with a large amount of marijuana, more marijuana than anybody could have for personal use, the police and prosecutors may decide to charge you with Delivery of a Controlled Substance or with Possession with Intent to Distribute or Deliver. In addition to recovering a large amount of marijuana, the police may also recover other items with which may indicate that the drugs were being sold. An example would be if a scale and plastic bags were recovered along with the marijuana. A prosecutor may feel that they can prove that you were selling the marijuana even though they have no evidence of drug dealing. 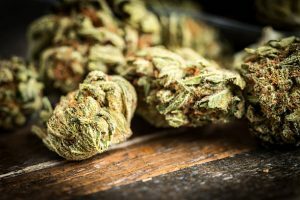 But if you are being charged with selling the marijuana, the law and the court will treat you much more severely than if you merely possess the marijuana for personal use. While a prosecutor will have a hard time convicting you of dealing drugs just because you possess the large amount of marijuana, whether such a prosecution could be successful or not depends on the unique facts of your case. It’s very important that if you are facing criminal charges involving the possession or distribution of drugs, you need to consult with an experienced criminal defense lawyer who could look out for your best interests and do everything possible to win your case. Possession of Marijuana lawyer, James Dimeas, has spent the past 25 years handling Possession of Cannabis cases throughout Chicago, Cook County, DuPage County, Kane County, and Lake County. Possession of Cannabis attorney, James Dimeas, is an award-winning criminal lawyer. He was recognized as a “Best Criminal Defense Lawyer in Chicago” by Expertise in 2017, and a “Best DUI Attorney.” The National Trial Lawyers have recognized James Dimeas as a “Top 100 Criminal Defense Trial Lawyer.” The American Society of Legal Advocates have named James Dimeas a “2018 Top 100 Lawyer.” The American Institute of Criminal Law Attorneys has recognized James Dimeas as a “10 Best Attorney Client Satisfaction.” AVVO has ranked James Dimeas as “Superb”, the highest ranking possible for any lawyer in the United States. If you are facing Possession of Marijuana/Cannabis charges in Chicago, Cook County, DuPage County, Kane County, or Lake County, you can always contact attorney James Dimeas anytime for a free and confidential consultation. You can always talk to James Dimeas by calling him at 847-807-7405. Kane County Reports Rise in Drug Cases While Police Agencies Struggle to Deal With Drug Addiction, by James G. Dimeas, Chicago Criminal Lawyer Blog, July 25, 2017.